The NY Daily News expressed concern that Mets pitcher Jenrry Mejia might not start the exhibition game against the Toronto Blue Jays last Friday due to a right arm contusion and a troublesome bunion on his right foot. For some people, bunions are nothing more than an unsightly deformity. For others, it is a debilitating injury that gets in the way of everyday activities and requires surgery. This Mets fan is worried that pitcher Jenrry Mejia may be sidelined with bunion pain this season. Pitching coach Dan Warthen told media he knew the bunion had been bothering Mejia and that the pitcher planned to use special cushioning in his shoe to cope with the injury. Team manager Terry Collins said that Mejia’s playing could be limited or even prevent him from starting. “I go out there and throw strikes. I keep my concentration and never think this is my last chance,” he explained. 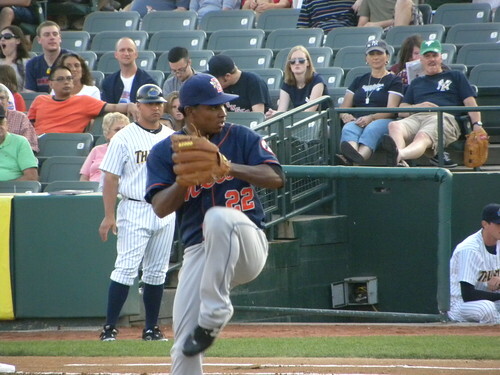 Despite his confidence, it’s not the first time Mejia was shut down due to injury. He missed 50 innings in 2013 due to a bone spur in his elbow, so management has kept him pitching no more than 108 innings per season. The bunion is new to the list of agitations. Bunions are often hereditary, but can become aggravated by wearing shoes that are too tight. One can see how baseball players can be especially susceptible to bunion development, then. Cleats aren’t exactly the most comfortable shoe on the market. However, there are a few good options for baseball players with bunions. New Balance is an excellent shoe recommended by podiatrists for their roomy toe-boxes. The New Balance MB3030, MB4040 or the YB4040 baseball cleats are all good bets. Mizuno is another brand well-suited for bunion sufferers, with the Mizuno 9-Spike Franchise 6 baseball cleat earning a nod from podiatrists. In addition to choosing the right baseball cleat, baseball players can also — like Mejia — add special padding to the shoe to relieve pressure from the bony growth. A bunion shield, bunion sleeve, bunion cushion, or bunion guard are all options. Remember, as Livestrong reminds us, icing and over-the-counter anti-inflammatory drugs can go a long way in providing relief from bunion pain, too. A bunion is unsightly, but should you have surgery? Experts say you should weigh the benefits of a pretty foot with the cons of a painfully slow recovery. For severe bunions that cause a tremendous amount of pain, surgery may be needed. Another reason to consider surgery is if you have trouble finding shoes that fit comfortably. Bunion surgery is generally not recommended just for cosmetic reasons, due to the extensive recovery time. In severe cases, it could be 3-4 months before you are back to wearing a regular shoe again, and complete healing could take up to a year, says the Mayo Clinic. For most cases we see, the recovery time is about half as long. There are over 100 types of surgical procedures for bunions, so it’s important that you see a bunion expert, like Dr. Josef Geldwert at The Center for Podiatric Care and Sports Medicine. Dr. Geldwert can help you choose the right type of procedure for your particular condition. Dr. Geldwert brings several decades of podiatric surgeon experience to the table, so you can feel comfortable that you’re getting the best care. Book a NYC consultation for bunions online. » Spring Checkup: Are Your Feet Healthy?